I got off the bus this morning, after an hour and five minute commute. (I love public transportation.) As soon as I exited the bus, I saw this beautiful flower on the tree. 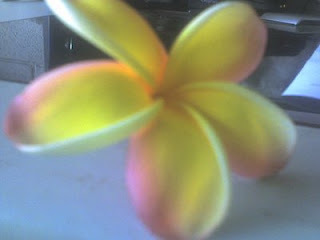 For those who live on tropical islands, a simple plumeria is abundant especially at this time of year. I don't know what it was about this flower but it called me, beckoned me to look at it, and now it sits on my left ear as an adornment to my face. The flower smells so sweet. Its simple beauty reminds me of our creator's abundant universe and I am so grateful to be in it. I love how you are so connected to your surroundings. In this hectic world, we should all take time to step back and enjoy the beauty god has given us. i gotta get back there soon!